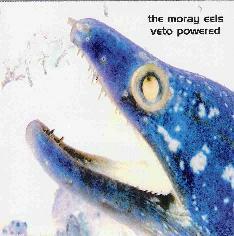 The Moray Eels - s/t / "Veto Powered"
The Moray Eels was a solo project from ST 37 bassist/vocalist Scott Telles, with help from numerous guests, including his ST 37 cohorts. The self-titled CDR on Blue Circle reissues a 1992 cassette that compiles songs from over the years going back to 1980. 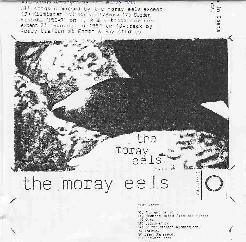 Despite this disc being credited to The Moray Eels, the tracks notes reveal that much of this was actually recorded under different band names. "Elevator To The Stars" opens the set with some really raw stuff from 1980. Young musicians flexing their embryonic creative muscles, but forging ahead in the early DIY days by recording their own music. The track notes also point out that this was Scott's first recorded bass track. Subsequent tracks features equally raw music by budding artists, but there's lots of exploration and experimenting with instrumentation, sound manipulation and efx, and despite the plodding and uncertainty, there's a wealth of imagination, sometimes elusive sophistication and promise of great things to come. Just dig the aptly titled "Ornette", which with the inclusion of sax gives a free-jazz edge to the New Wavey rock bass and drums. Horns crop up from time to time throughout the set, another interesting piece being the free-jazz experimental nature of the trumpet-coronet "Duet". "Wonder Boy" is another noteworthy tune that starts off as an oddball noodling pop song with Scott handling all the instruments. The song itself is simple but catchy, and is backed by some weirded out fun music that is far from pop. And at 8 minutes Scott takes off into all sorts of wild directions. Once again we've got some pretty raw stuff, but there's lots of cool efx and a clear determination to try different ideas and put some serious thought into the music. The Moray Eels also do some cover tunes, including a rousing ST 37 styled rendition of Motorhead's "Orgasmatron", a dissonant avant-garde cover of Hawkwind's "Infinity", and a stoned noise-punky cover of Nikki Sudden's "Breaking Lines". Veto Powered is a collection of mostly live tracks, all of which seem to be from the past few years. About half the songs feature Scott solo on guitar, bass and synths, and the rest with various other musicians. "Wallowing" and "Pan" are the opening tracks and feature an eerie early 70's kosmiche synth sound that I enjoyed. Decent stuff but both these tracks are cut off very abruptly which I found a bit jarring. The guitars take over on "Fins Pinned Back", which brings us more into cosmic heavy rock territory. Scott rocks hard but manages to maintain a drifting spacey atmosphere. I really liked this one. Scott also does an interesting cover of Motorhead's "1916". "The Mind Dome" is one of my favorite tracks of the set, being a drugged, droning, tripped out stoner space tune with both Scott and Colleen Gugan on vocals. Excellent! The last of the solo tracks is "The War Arrow Points To Earth", a nearly 14 minute synth and keyboard piece with lots of good ideas but unfortunately doesn't flow very well for that length and struggles too much to settle into a solid theme. "World Piece" kicks off the collaborative tracks with Scott teamed with Brian Wotring on guitar, performing a blend of kosmiche music, drones and strumming guitar. "Satch Nature" is recorded by a guitar/synth/drums trio playing a mixture of raw garagey and wah'd rockin guitar and a playful synth melody. "Mt. Hood" features the same trio except the synth is traded for bass and results in a cool jamming cosmic rocker. And "Deep Time" and "Shell-Shocked Receptacle" are live tracks with lots of talking in the bar, but are among the most pleasant songs of the set. In summary, these discs were fun to hear as we're treated to a through-the-years journey of Scott's various projects and really get to hear how active he's been outside of ST 37. Much of it is raw and stripped down but there's lots of tasty ear candy to be heard. For more information visit the ST 37 web site and click the For Sale link at: http://www.st37.com. Email Scott Telles at: scotttelles@yahoo.com. Contact via snail mail c/o Blue Circle; PO Box 4962; Austin, TX 78765.